Dolomite, part of the Blacktrace group of companies, is celebrating a decade of excellence in the design and manufacture of novel, high quality microfluidic products, including individual components such as pumps, chips, connectors, temperature controllers and sensors, software solutions and complete microfluidic systems. The company, based in Royston, UK, was the world’s first microfluidic application centre, and has gone from strength to strength since its formation in 2005, opening offices in the USA, Japan, India and Brazil, and establishing a global distributor network. Today, it serves many thousands of customers in over 50 countries around the world, working in fields as diverse as academia, biotechnology, drug discovery, food and cosmetics, manufacturing, and the petrochemical and pharmaceutical industries. 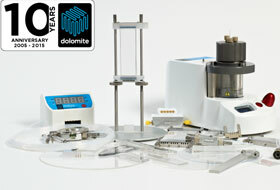 Dolomite’s expertise in Productizing Science® – creating marketable, commercially successful products from scientific discoveries – has enabled the development of many innovative products, including the first microfluidic connector, novel microdroplet systems and the recently showcased Fluidic Factory 3D Printer. Designed to suit a wide range of budgets and functionalities, the company’s modular microfluidic systems offer the flexibility to quickly and easily vary the configuration to accommodate changing day-to-day needs or to upgrade, for example to include automation. System set-up and operation is fast and straightforward, allowing rapid research, optimisation and scale-up of microfluidic processes. For customers requiring a custom-built microfluidic solution, Dolomite also offers a bespoke design service, producing components, modules and systems tailored to specific individual needs.